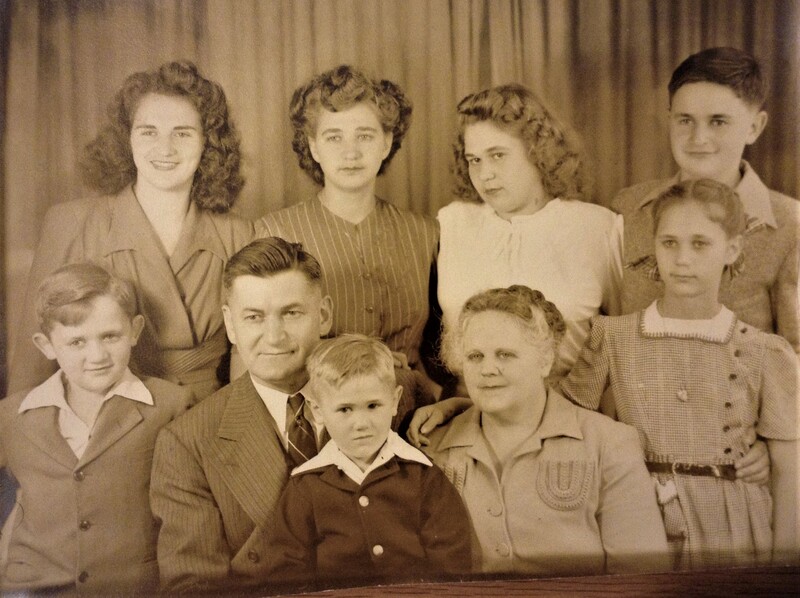 Since I was the 7th and youngest child of Arnold Borel and Mary Kirby Borel I missed a lot of the history of both the Borel and Kirby families. 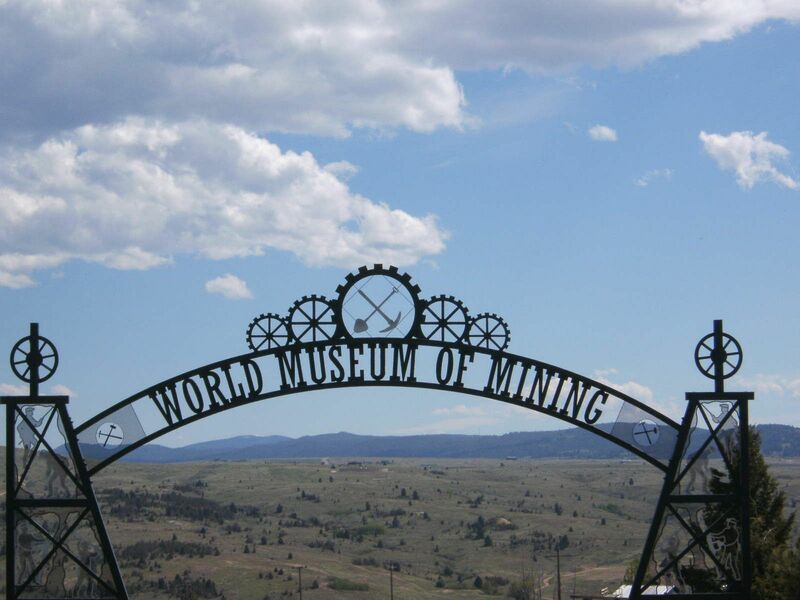 Much of the early history centered around Butte, Montana. Mary and Ann in particular were close to cousins in Butte because they went to nursing school there. Joan and Gene played with Kirby cousins, Johnny who had been living with a family of racoons finally had his adoption approved, and I wasn’t born yet. 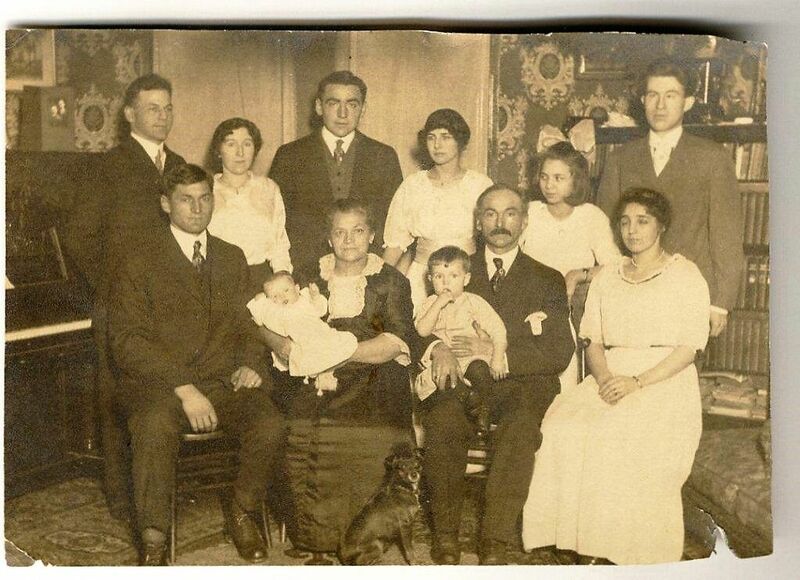 After Butte our family was on the move into Oregon and eventually settled in Arcata, California. I was about 3 when we moved to Arcata and it was only a few years before Mary and Joan were married, Gene was in the air force as a radar specialist, May was in college at Humboldt and John and Ann were at Cal Berkley. They didn’t leave in that order, but the point is while I was in grade school and High School they were all busy. I’m sure I’m not the first or only person to be told these memories of Dad; and I probably don’t remember them as accurately as I should. But I hope they give you a little glimpse into the man. We all loved him dearly. In the First World War, anyone caught leaving their platoon without a leave was court-martialed and shot on the spot as a deserter. Dad’s group was pulled back from the front and given a 3-day rest period. They were only a few miles from the Swiss border. Across a river near his encampment there is a city in Switzerland and I don’t know the name of it. Dad had cousins in that city and he promised his mother he would go to see them. He told one of his friends he planned to cross the river at night into Switzerland and fulfill his promise. His friend begged him not to go because the US Army was closely guarding in that area searching for deserters trying to escape into neutral Switzerland. His friend warned him he would be shot but Dad felt it necessary to go. I don’t know how he found a smuggler but he was smuggled across the river and into the city, found his Borel cousins, and returned to his platoon without being caught. Believe me when I tell you I am so glad he never got caught. I don’t know why Dad chose Montana to get his mining engineers degree. I know he was an exceptional and respected student. He was hired immediately upon graduation by the Anaconda Copper Company in Butte. (More about that company later.) But besides being a top student Dad found football. I know football was one of his true loves in life. He was captain of the team. He is the holder of the football in the team photo. I hope you get a chance to see the photo because it shows a rag tag group of guys with leather helmets, padded pants and tiny shoulder pads. I know you had to be tough to play in those days. And no one was tougher than Arnold “Elmo” Borel. I saw a clipping from the Montana State University newspaper when the Miners were coming into town and all they could write about was Big Elmo Borel and how the Grizzlies had to control the Miners right tackle, one of the strongest, dirtiest players in the league. I’m sure being called a dirty player in those days was actually a compliment. He was elected to the all-conference first team. 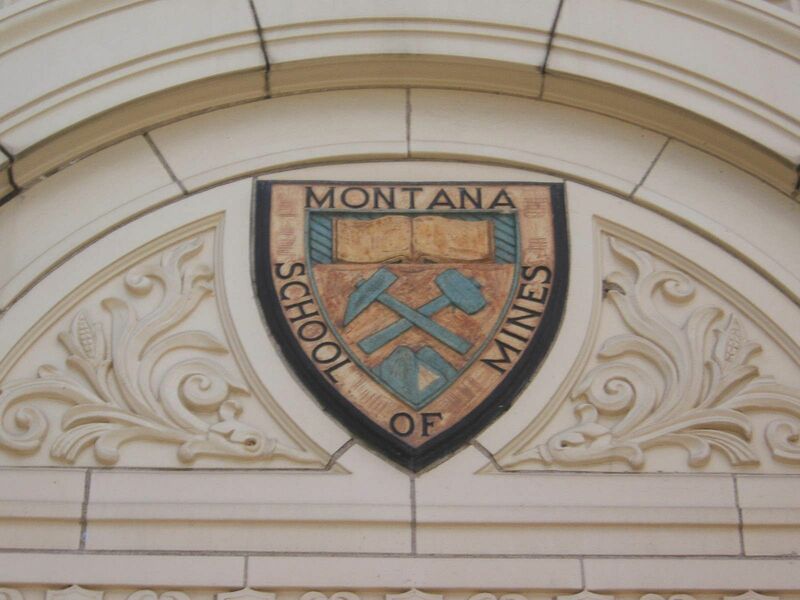 Considering the School of Mines played the University of Montana and Montana State that was a grea t honor. Ann, Mary, John (and Phyllis), and I with Mom made a family trip in the mid 1980’s to Mom’s birth town, Marysville, Montana. It was a centennial celebration of the Catholic church there. We were lucky to be invited to a cousin’s wedding in Butte. I had the chance to talk to older cousins who went to school with Dad. I have never heard as much praise and respect given any man at any time in my life. And they told me it was pure evil what the Anaconda Company did to him. 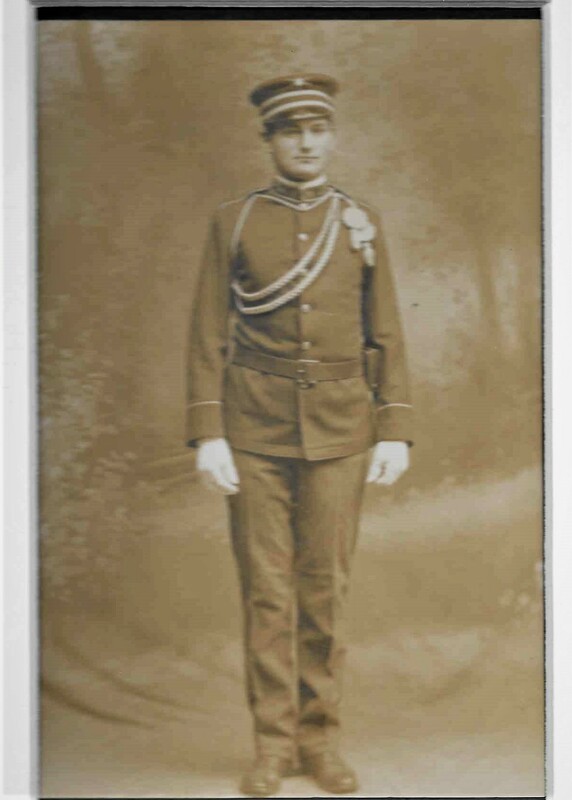 Other than football and school Elmo Borel avoided most social functions…except one time a friend talked him in to going to a dance…and he met the girl he was to marry and love the rest of his life, Mary Kirby. 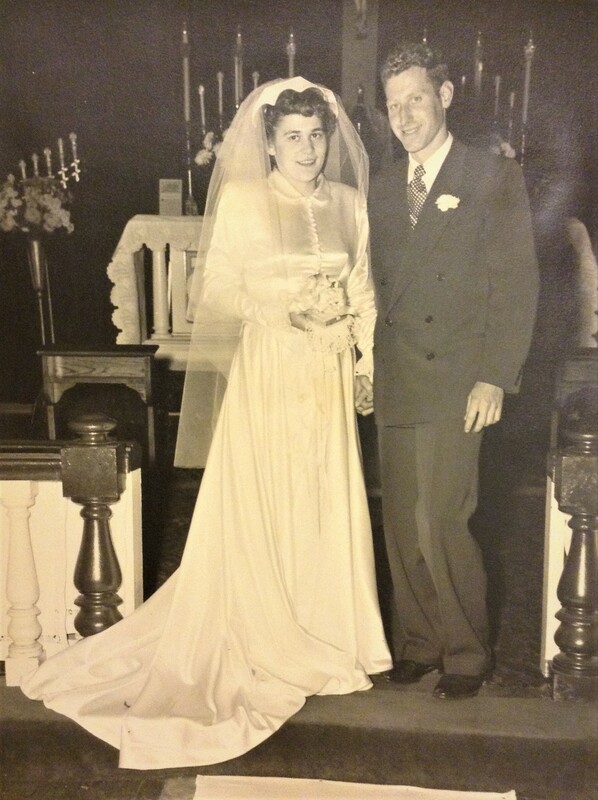 Dad was devoted to my Mom, as she was to him. There is a book called Work Song by Ivan Doig that describes Butte and the Anaconda Mining Company. The book describes the terrible the working conditions for the miners and how the company disregarded their safety. The city, the police, and the state government were all in the pocket of the company. The Anaconda Company in 1922 was known world-wide for bribing officials and for destruction of the environment. Workers in foreign countries were essentially slaves. Anaconda was one of the world’s most powerful companies. Conditions in the mines in Butte became so bad that after a pay cut, the Union finally declared a legal contract strike. It was brutal with outside union busters hired to tear down the pickets in an attempt to break the union. It was a terrible situation for a man of principles. Dad was considered management and was required to cross the picket lines even though it was a legal strike. Much of the strike was about safety issues and Dad agreed with the union. He refused to cross the picket lines. He was not only fired, but Anaconda blackballed him from working for any mining company anywhere in the world. He went from a promising engineer to being unemployable in the private mining world. Such was the power of companies in those days. Although unions have had their own problems with corruption and unethical bosses, I will always support the idea of unions to fight for the rights of the workers because of this. But Dad had talent and was hired by the US Government to assay mineral deposits around the country. It was a good job but it required moving the family of six and then seven. 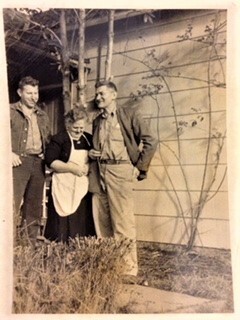 Dad knew it was hard on Mom and the family so after several years he took a job in the Arcata post office. It allowed him to maintain his government pension plan and to settle in one town. I was about four. I realize my experience of going to school through High School in one town was different from the rest of the family. Some of what i remember is fact and some is from hearing stories told about ‘Fort Peck and it is hard to define the difference, but here goes. Closing my eyes I am trying to remember a time of 84 years ago when I was five. I do remember cold and snow and subconsciously I remember the terrain around Fort Peck. When i would draw pictures of scenery I always draw some funny looking hills. Mary, at one time, told me that I drew the coulees surrounding Fort Peck, it was prairie mostly. The home we had was on the edge of town and faced the prairie. I believe that the Hospital was at the far end of the street as an ambulance would go screaming past at least once a day if not more often. I vividly remember that on one day as it went past, Mother got all weird. We soon found out that Daddy was in that ambulance and that there had been a cave-in and that was when Daddy had injured his thumb. I later was told that they wanted to amputate but he refused saying it was his opposing digit and very much needed, even if crushed. There was a party that Mother talked about. Daddy was a part of the Corps of Army Engineers and as such was invited to many social events and one party in particular Mother talked about a dance, and for some reason Daddy could not dance, so when it was ladies turn to choose a partner Mother, unknowingly, chose the Big Boss. she said Daddy teased her long after. Also at that Party they won a roasted pig, complete with apple in its mouth but I have absolutely no memory of that. She said that they shared it with many of the engineers. I wish that they had a picture. We evidently lived near the main street because I do remember walking to the corner and buying? ice cream cones. I put in the question mark because Mary once told me that we would walk May down to a drugstore on the corner. May was the baby and we all know how adorable she was. Barely walking, Mary and Ann would take her to the drugstore, I would tag along and they would give us a small ice cream cone at least once a week. I have vague memories of that. I do remember that Daddy was busy and that he was well liked. When we went anywhere people would stop and talk to him and always smiled. Other than that I have no memory of what our parents were like, and only a few personal memories and what Mother told me, I wish I had more. While Arnold was still working as a government assayer he had a large project in a remote mountain area near Leavenworth, WA. An unpaved road was built for access and a campsite was established. I don’t know but I believe the project was to last much of the summer. The site was so remote there were no means of communication to the outside world except by hand delivery from Leavenworth. One late afternoon a telegraph was delivered to Dad telling him his brother Milton had died. It isn’t like today. Dad was devastated but could not get away. He told me he sat alone not knowing what to do. He felt guilt that he had not been home in a long time. He sat there feeling lonely before deciding to walk down the road from the camp. Because of the tall trees, and remoteness of the area there was an eerie stillness. Then as he walked alone down the road there was a rustling noise beside the road. A dog came out from the woods and started to walk with him. The dog did not beg to be petted but only silently accompanied him as he walked farther. Evening comes quickly in the mountains so after a long walk Dad and the dog turned and walked back towards the camp. It was getting dark with the only light coming from the blue sky above the road. When he reached the place where the dog had joined him, the dog stopped and returned to the woods. That is when Dad said he felt a tremendous calm. The next day he asked around the camp who owned a dog but no one did. Workers who had been there longer than him said there were no houses or other campers for miles and miles. The Great Red Scare followed WW2. The war ended in 1945 and The Cold War between communist Russia, China and Korea and the democratic countries was a legitimate concern. This isn’t a history lesson but beyond football, Dad was deeply concerned about poverty, politics and the economy. Lenin and Stalin were willing to fight for Communism. They attracted workers around the world. Poor people couldn’t see that communism talks about sharing of wealth but ends up creating a totalitarian state. Democracy and Capitalism offer the ability (supposedly) of controling the excesses of power by the voters. Dad recognized the evil of communism, but he also felt strongly that greed and power would eventually cause a collapse of capitalism. He lectured me on the accumulation of wealth in the hands of the few. I heard him say over and over, “Bill, wealth is an illusion. The money in the banks and in the companies are just numbers. They aren’t backed by anything real except credit and the peoples’ belief in the numbers.” This is him talking, not me. What he did believe was that technical knowhow could provide an abundance of goods. He believed scarcity was artificial. He wrote several articles that were published in a national magazine called, “The Technocrat”. If you are following this you can see that technocracy, like communism was a threat to capitalism. It wasn’t a big enough movement to be a real threat, but a group of politicians and very power-hungry donors led by Senator Joseph McCarthy started a witch hunt. It was a true witch hunt on anyone that was a threat to the new status quo. People were jailed, and careers ruined. I will leave it that Dad was furious with McCarthy, but also afraid of being named a communist because of his writings. And realistically since Dad was a government employee he could have been investigated and fired. McCarthy’s motto was, “We have to rid the government of the traitors and communists”. Thousands were affected and jailed. Eventually McCarthy over reached and the threat was over. About 1954 a doctor who had also gone to the School of Mines and knew and respected Dad approached him to develop a gold mine in the interior of Venezuela. It sounded like a great opportunity and it gave Dad the chance to do what he loved most: mining and minerals. The doctor had the mineral rights and it appeared the biggest hazard was the remoteness of the mine. As always, taking care of the family was Dad’s biggest concern and the doctor promised to pay a salary to Mom. Once Dad was in Venezuela the pay checks quit coming. The cost far exceeded the doctors’ ability to pay. Everything depended on the success of the mine. After two years it failed and Dad returned to Arcata and the post office. It was crushing. The real hero during this time was my mom. She had a nursing degree but had not used it. She was able to find a job near us taking care of a paraplegic. It was hard work and did not pay very well but she managed to provide for us. We were poor. And yet she found the 25 cents to send me to the Saturday matinee. Thank you, Mom. The family grew and spread out. We went to Toronto, Oklahoma, Louisiana, Colorado, San Diego, Afghanistan and New York, Red Bluff and Gerber, Texas, The SF Bay area, Oregon and Washington State and other places. Dad needed more care. I don’t know what caused it but the great mind needed help. It was the week before my spring finals at the University of Washington when I got the call from Eugene to come to Red Bluff. Dad was in a coma. I was able to take incompletes in my classes, got on a Greyhound, arrived at some ungodly time in the morning, and was rushed to the hospital. Everyone in the family was there except Johnny. John had joined the Peace Corps and was stationed near Kabul, Afghanistan. The Peace Corps notified John that Dad was in a Coma and they would do whatever they could to get him there. He refused to die. Who knows what a person in a coma knows? Dad preserved all of his energy. He did not move but quietly breathed. We all took turns talking to him, telling him the things we wanted him to know one more time. And then it became a race to get John home. The Peace Corps flew him from Kabul to San Francisco. Mary had a friend with an airplane who waited at the San Francisco airport and picked John up as soon as he landed. We were constantly informed where John and the plane were. We started telling Dad John was in San Francisco, he is on a plane, he landed in Red Bluff. We waited. And then there was a rush and the door swung open and John was there. He was tired and looked at us not knowing anything other than Dad was in a coma. He moved to Dad’s head and said something. Dad let out his last breath. Two words best define our Mother: Faith and Family. Although this paper is about our Dad, I have to say Mom was the glue. She was the stable one when you might least expect it. She had a strength and resolve that carried her through some tough times. 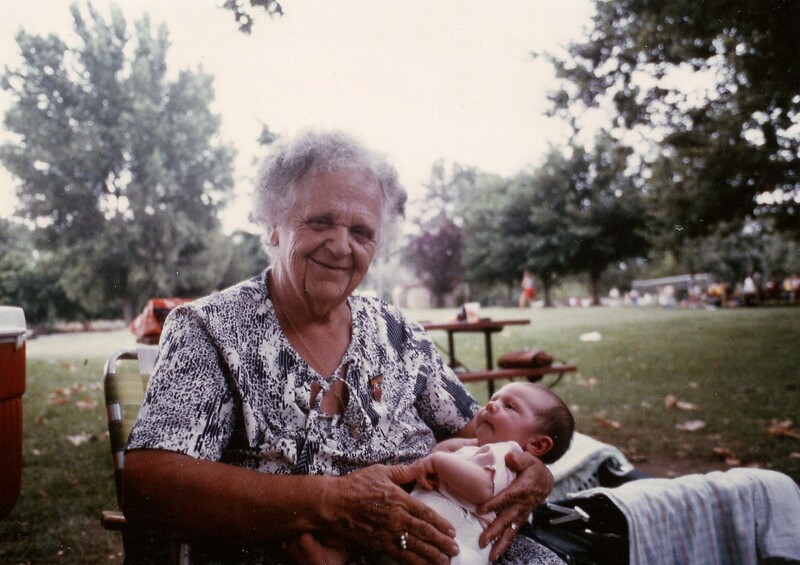 True to her Catholic upbringing she made every Mass, every Rosary Friday, and every holy day. Her look when praying told you she was communicating with God. She loved Dad and he loved her. She supported him in decisions that did not turn out well. And most importantly she loved us kids and would fight for us. And together they passed on to all of us life lessons and style more valuable than money. It’s true, look around. 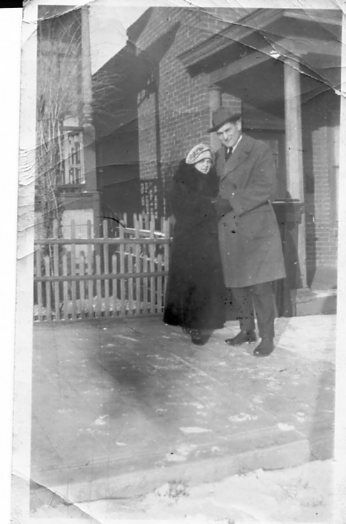 This entry was posted in Family, History, inspiration, Nostalgia, parenting, Slice of life and tagged Arnold, Arnold Borel, Bill Borel, family, heroes, memoir. Bookmark the permalink. Thank you so much for taking the time to write this. I always feel that if that job is not done, the history will simply vanish.